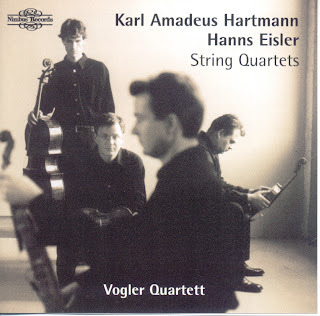 Anyone who, like me, is most familiar with Karl Amadeus Hartmann from his orchestral music may be surprised by the lean, ascetic textures in these string quartets. There is a certain Mahlerian Romanticism about them, and the solo openings, viola in the 1st Quartet, violin in the 2nd, both call to mind the Adagio of Mahler’s 10th Symphony. But this is clearly the music of a later period, and the intercession of Schoenberg and Berg always mediate Mahler’s voice. The leanness of the sound is at least partly the result of a conscious decision by the performers, I suspect. You could give this music a warmer, rounder profile, and results would be completely different. But what is presented here sounds truer to the music. The sound often has richness, and the cello is very prominent in the mix, which adds a satisfying gravity. But overall, the Hartmann works are presented as skeletal vestiges of the proud German music traditions, surviving in emaciated forms under the yoke of the disapproving Nazi regime. There is a linearity to the music, which relates back most directly to Schoenberg and often beyond, especially when fugal forms evoked. But then there are times when, for example, the parts run in parallel chromatic reflection, bringing the more recent influence of Bartok into focus. There isn’t much levity (how much would you expect in a work like the 2nd Quartet that was written in Berlin in 1945?) but there is often lightness of texture. Hartmann comes across in these works as a paradoxical figure, his language essentially Romantic, but expressivity is always at a premium. Listening the contemporaneous Eisler Quartet leads to the suspicion that this icy demeanour was a product of the time (so why didn’t Richard Strauss suffer from it?) Eisler is more ‘advanced’ in his techniques; the music is strictly serial (so far as I can tell), but that in itself does not distance it from the soundworld of the, at least nominally, tonal Hartmann. Both composers maintain a psychological stability in the way that their music evolves through linked textures rather than through abrupt changes. Hartmann’s music is more melodic than Eisler’s, but both maintain that direct sense of logical linearity that allows the ear to follow the music’s progression, be it through melodic contour or contrapuntal intrigue. The Volger Quartet give convincing interpretations throughout. As I mentioned, the cello is satisfyingly prominent, and in fact all of the instruments have an immediacy of tone that suggests close micing. Dry never means austere for these performers. They hold back on excessive vibrato and often create fairly brittle tutti textures, but never to the detriment of the music. The music of both composers, and Hartmann in particular, presents opposing demands of Romanticism and Modernism to the interpreters. Bartok offers them a model for the middle way they need, and you get the impression he has been as important to the players as he was to the composers. Overall, this is a fascinating disc, of most interest, perhaps to those with a taste for 20th century string quartet writing who are seeking to fill in the gaps. Hartmann bridges the pre- and post-war worlds of German music, and perhaps the stylistic distance from one side to the other is one of the reasons this music is so difficult to place. Eisler is at least as well known for his writings and his politics as he is for his music. His String Quartet presents him as a thoughtful and committed man, and not one to sacrifice musical values for ideological principles.